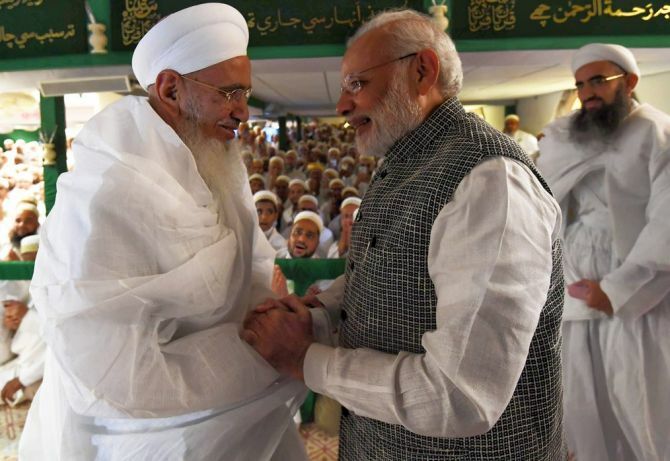 Prime Minister Narendra Modi on Friday invoked Imam Hussain, the grandson of Prophet Mohammad, to emphasise the need for peace and justice, as he visited a mosque in Indore to attend an event organised by the Bohra Muslims. 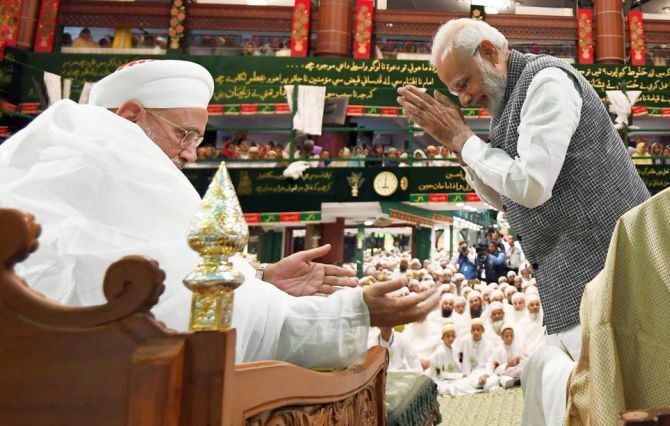 Modi shared the dais with the Bohra community's spiritual head Syedna Mufaddal Saifuddin at the 'Ashara Mubarak' event, which commemorates the martyrdom of Imam Husain, at the Saifee Mosque in Indore, Madhya Pradesh. 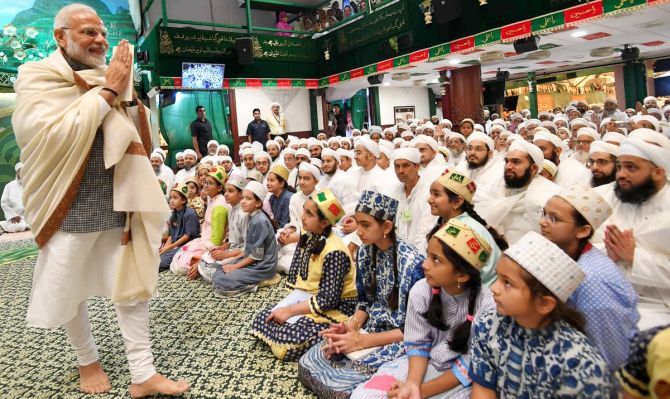 According to a spokesman of the Bohra community, it is the first time that a prime minister has attended the 'Ashara Mubarak' programme of the community held annually during the first 10 days of the Shia calendar, coinciding with the Moharram. He added that these teachings of Imam Hussain were more important today than those times. “The concept of 'Vasudhaiva Kutumbakam' is a great strength of India, making it distinct from others. 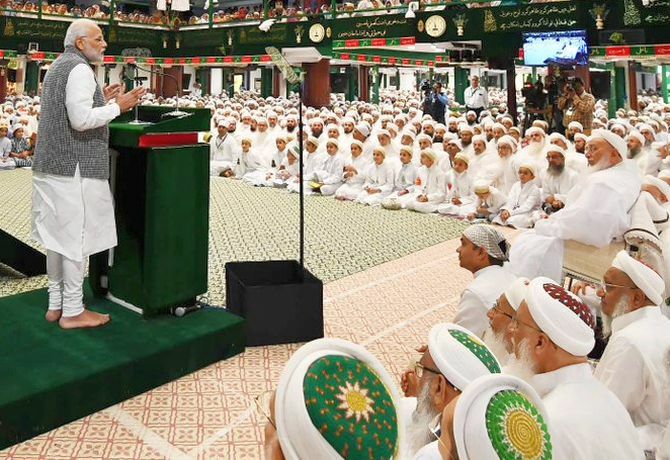 The Bohra community is making the world aware of this concept through its work,” Modi said. Vasudhaiva Kutumbakam, he explained, is an ancient Indian concept which envisages the the world as one family. In his address, the prime minister spoke about his government's initiatives like 'Swachh Bharat Abhiyan' (cleanliness campaign), 'Make-in-India' programme and rollout of the Goods and Services Tax (GST). At the same time, he added, ‘all five fingers of a hand are not equal. Some people consider fraud as business’. “Honest businessmen are being encouraged through steps like GST and Bankruptcy law," Modi said. The 'Swachhata Pakhwada' (cleanliness fortnight) will be launched on Saturday and will culminate on October 2, Gandhi Jayanti, he said. “We are eying the double digit. I believe that the country can reach to the goal despite all the challenges," the prime minister said. Modi also said that his government has given priority to health and nutrition sectors and that it was being done for the first time in the country's history. He also lauded Indore for topping the nationwide cleanliness survey earlier this year. Are Muslims really scared of Narendra Modi?